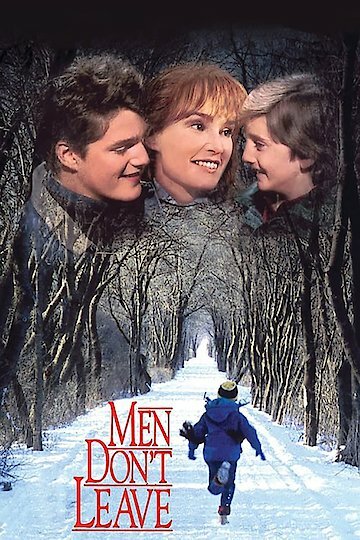 Men Don't Leave follows newly widowed Beth Macauley and her difficult relationship with her two sons. After pulling herself out of the shock and depression of losing the cornerstone of their family, Beth realizes with the death of her husband comes the death of her comfortable lifestyle as well. Blindsided by the unexpected tragedy, Beth struggles to keep her suburban house and old life while somehow settling her deceased husband's debt. Ultimately, Beth makes the decision to sell her home and, with teenager, Chris, and younger son Matt, she relocates to Baltimore, Maryland. After gaining employment at a run-down gourmet bakery, Beth seems to resign herself to the idea that her new life will be a constant struggle filled with difficulty. Then she meets Charlie, a struggling artist, who gives her a glimmer of the happiness she so abruptly lost. His kindness boosts her self-esteem and briefly changes her mindset, until she loses her job. Beth takes to bed for five days in an emotional relapse of depression. The intense drama is broken up with the comedic relief of son Chris falling in love with an older, eccentric neighbor. Chris is drawn to her quirky sense of humor and the maternal warmth that has been missing since his mother has become more and more absent. While the family factions off and finds their own paths in their new life, the youngest son, Matt, is left by the wayside and falls in with a bad crowd. Matt soon begins breaking into homes and stealing electronics. His motivation is not to regain lost attention, but the belief the profits can eventually buy their old home back. The story of Men Don't Leave is not only about the loss the Macauley family feels, but the tale of three individuals who are forced to reconfigure their places in a new family structure and a completely new environment. Men Don't Leave is currently available to watch and stream, buy on demand at Amazon, Vudu, Google Play, iTunes, YouTube VOD online.